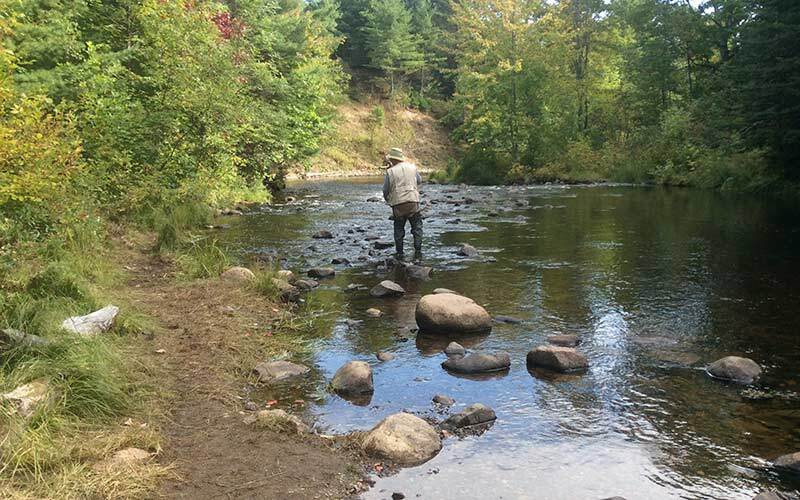 Experience fly fishing in Northern Ontario in Bruce Mines and area from the shores and bays of the North Channel plus local inland lakes and rivers.The shores and bays of the North Channel offer much area to be explored and fished with the fly rod. There are places west of Bruce Bay near Portlock Bay which abound with weed beds and lurking fish waiting for a tender morsel to land above their hiding places in the underwater gardens. Go east to Perch Bay or Garden Bay areas and a similar environment opens up with miles of sheltered shore line to work. Both of these areas are best worked from a small boat. Both dry fly and wet fly streamers can be used. Be careful though as the wolf of the bays, the Northern Pike, also lurks in the same environment. The best time for this kind of fishing is after the growth of the weed beds in the early summer and on into the fall. Only 45 minutes from Sault Ste Marie which offers the board walk to fish from or the rapids. In the early spring when the run off is still flowing the rivers of the area provide opportunities to get rainbow trout. The Thessalon River at the Ansonia Bridge and upstream at the rapids just north of the bridge, plus at Little Rapids General Store just north of Thessalon are favoured places to work a fly for the rainbow. Visit Rydal Bank, a small hamlet only a 10 minute drive from Bruce Mines, and fish below the dam of the Thessalon River for trout. In the fall salmon can be caught as they swim up the river for their spawning run. There are many small inland lakes that you can use a canoe or small boat or fish from the shoreline. Some of the inland lakes are Ottertail, Rock, Desbarats, Patten Lakes and many more only a short drive from Bruce MInes. The lakes yield pike, perch, bass and pickerel for the ambitious fly fisher. Most have boat launches. Sault Ste Marie is only 45 minutes west of Bruce Mines and the rapids offer world class fly fishing. Come and stay in the area to relax and fish. A fly rod gives you the real experience of fishing and the opportunities are here for the person who wants to seek them out.